With every new year, there are new trends! The year of 2018 is going to be the time for bold, yet minimal paint choices for the home. These paint color trends are pulled from all parts of daily life to predict the up and coming colors for this upcoming year. 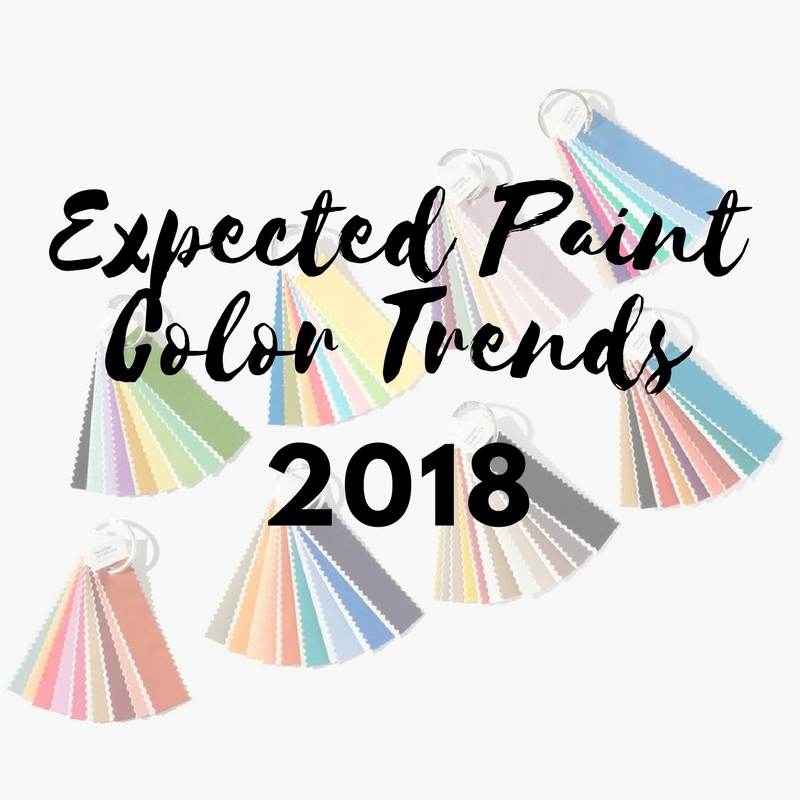 Here’s what’s trendy and here’s what out for paint color trends in 2018! Minimalism is going to be taking 2018 by storm. This is where you have only what is needed and nothing more. You do not have to go as extreme with being fully minimalist but it is something to consider when painting a room in your home. Creating a room with a minimalist feel that will create a space to relax and recharge. Whether you want to have one, two, or three colors the key is to make sure everything blends. You want to stay away from super bright or dark colors and opt for a organic neutral/muted color. This is when you create a space where you can be inspired and innovative. Colors that fall under this category would be modern yet playful. Colors can include an exuberant orange, blue, green, or yellow. This is the crisp, clean colors and lines that everyone is used too but with a twist. The classic theme is marked by a dark hued color with a crisp white to brighten up baseboards, furniture, doors, or whatever else you want to paint. Allow the dark hue to draw the attention to the room. Accent walls and furniture a making a comeback. High gloss furniture pieces and matte walls are just a few examples of what to come in 2018. 2018 is a year of possibilities. Here are the color palettes that will be bringing in the new year. The three bright color palettes are designated by the terms: Affinity, Connectivity, and Sincerity. Blue, fuchsia, and brown. These are warm and cool tones will bring out the life of your room. Blue, green, and yellow. These strong colors bring out a sense of power and strength. Neutrals, green, and pink. Warm earthy hues and rosy pinks are the way to go! Especially if you don’t have a bold preference. All “good” things must come to an end. That goes for paint color trends. I have to admit, I’m not especially sad about seeing some of these colors disappear. Here are trends that will be dying out. Hues of purple. The once popular color (especially in the 80’s) is now one of the trends that are no longer sought after. Aim for colors close to a plum, wine, or amethyst if you decide you absolutely must have purple. Say goodbye to any royal colors. Different shades of golds and Tuscan colors are out for 2018! If you are having trouble finding colors that you can relate to above, try picking a word which describes the goal for your home. You can then find color scheme associated with each one. Those words are: Resourceful, Verdure, Playful, Discretion, Far-fetched, Intricacy, Intensity, and Technique. These strong words that have their own artistic meaning. Pick which word you want to portray your home the next time you decide to paint. If you want a keen eye or a skilled painter, you know where to find us! Call us any time of day and get a free estimate. Fall in Summit county offers something to do for everyone. 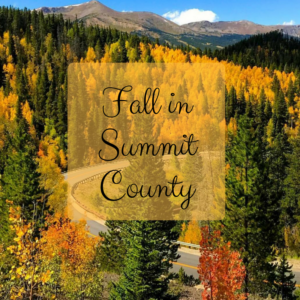 If you want to be in the great outdoors for every conceivable sport, shop at local farmer’s markets, attend free festivals, hike the most beautiful trails in the West then those are just some of the ways to enjoy Summit County in the Fall. Summit County, rightly nicknamed ‘Colorado’s Playground’, offers mountains of pleasure for the outdoor enthusiast this time of the year. In fact, all year round! Located among the towering peaks of the Colorado Rockies and immediately west of the Continental Divide, Summit County elevations range from just under 8,000 feet at Green Mountain Reservoir to more than 14,000 feet at Gray’s Peak. The dry, high alpine climate ushers in long, snowy winters that welcome world-class ski resorts and idyllic warm summers perfect for biking, hiking, backpacking, camping, fishing, kayaking and other forms of outdoor recreation. Communities within Summit County include Blue River, Breckenridge aka ‘Breck’, Dillon, Frisco, Silverthorne, Copper Mountain, Heeney and Keystone… and each community with its own unique characteristics offers something for anyone and everyone. There is so much to do, so much diversity and so many choices available that pages and pages could be written… literally. Watch hang gliders drop off Blue Ridge at Green Mountain Reservoir, or watch them take off from William’s Fork or, better yet, invite your friends to watch you enjoying the thrill for yourself. There’s one view of spectacular Summit County that you can’t get from anywhere else except a hot-air balloon ride. You can ride Keystone’s River Run Gondola up nearly 12,000 feet for incomparable panoramic views of Breckenridge, Lake Dillon and the surrounding mountains. Study the family of Osprey who inhabit the area at Lake Dillon or watch the hawks rest on the thermal winds near the Old Reservoir or search for bald eagles. Before the big freezes come, you still have time to put your kayak down the Blue River or get some time paddle boating at Keystone’s lake. Lake Dillion and Green Mountain Reservoir rental services include catamarans, canoes, kayaks, pontoon boats and other power boats. Kayak Park, in Breckenridge is the state’s longest with 15 water features that challenge all levels of boaters. Put a couple of extra layers on and enjoy the water while you still can. What’s your pleasure? Is it fishing? Summit has tons of places to fish and the fish population is unique and abundant. Choices include the Blue and Snake rivers, Ten Mile Creek or you can head over to Green Mountain reservoir. Only two places in the lower 48 have Arctic Char and Lake Dillon is one. Local waters also include Kokanee salmon, rainbow and brown trout. If you’d prefer a guide, there are many local companies available. Fall may be the perfect time to climb in Summit County. The heat has withdrawn and the Fall foliage has arrived. Soak in the incredible views from a wide range of hiking options – from stroll-like to strenuous. Off Montezuma Road just past Keystone, you’ll find a variety of climbs. The sport climbs vary in difficulty giving climbers of all abilities an opportunity to enjoy a fall afternoon on the wall. For hikers, area trails include Eaglesmere Lake and nearby Cataract Falls. In the lower section of Chihuahua Gulch, you can catch a glimpse of the spectacular color-changing Aspens. Aspens in the lower section of the trail, Elliot Ridge Trail with its panoramic views of the Ptarmigan Wilderness area. There’s also Upper Piney Trail, Pitkin Lake Trail, Deluge Lake Trail, Booth Falls Trail, East Lake Trail. Fall landscapes with stunning mountain backdrops make any hike more than worth it. Do you know what Biking in the Fall in Summit County means? It means cool temperatures for those long, steep climbs and majestic views from start to finish. Try the Breck to Copper run. Follow the path for fabulous views of Dillon Reservoir, the Ten-Mile Range, and surrounding peaks. Bicycling, whether mountain, road, mountain or cruising varieties are a huge attraction in the area and the League of American Bicyclists designated Breck as a Gold Level bike-friendly community. Frisco’s Historic Park consists of buildings from Summit County’s past, along with a small museum. The Breckenridge Sawmill Museum is a hands-on exhibit that explains the saw-milling and mining history of Breckenridge. The Mountain Top Children’s Museum engrosses children 10 years and younger with a variety of interactive exhibits and programs to encourage learning. The Red, White & Blue Fire Museum celebrates the history of the Breckenridge Fire Department and hosted by today’s firefighters. Visitors can see the original 1880 company’s human-powered ladder cart, a restored hose cart and other equipment and uniforms. The Breckenridge Welcome Center is an interpretive museum boasting displays on life in the 1880s and you can visit the Old Dillon Schoolhouse which is now a museum in Dillon. The Riverwalk Center is the center of entertainment in Breckenridge. Resident companies include the National Repertory Orchestra and the Breckenridge Music Festival and they offer an attractive line-up of film screenings, theater performances and concerts every year. Breckenridge has one of the largest historic districts in all of Colorado including more than 200 structures on the National Register of Historic Places. Frisco has eight historic attractions you can easily walk to from downtown. Search out old mines on your own, or go on a mine tour at Tiger Run or Country Boy Mines where you can walk 1,000ft underground in a 100 year old mine to view original mining equipment. There’s abundant mining history throughout Summit county. Take a walking tour of Breckenridge or go it alone and ride the trolley. Washington Mine Tour and Gold Panning offers a 90-minute tour covering the above-ground workings of the mine and mine shaft. The Barney Ford Victorian Home Tour is free and details the story of an escaped slave who became a prominent entrepreneur and civil rights leader. The hillsides around Copper Mountain and the rest of Summit County offer some of the best leaf-peeping in Colorado. Close to Frisco, the Meadow Creek/Lily Pad Lake trail wends through dense aspen groves before reaching the darker greens of the montane evergreen zone. Some of the aspens along the lower part of the trail are among the oldest and biggest in the area. For an easy walk with spectacular colors and views of Summit County, head over to Dillon. Make your way to the Oro Grande Road, which parallels Highway 6 leading to Keystone. The Ptarmigan Trail, in Silverthorne, provides panoramic views over Dillon Reservoir and the Dillon Dam and leads to a real aspen forest, where you’ll be surrounded by pristine color. For something different stop into Frisco’s VIVE Float Studio where you can passively “rest in the restorative and curative powers of float therapy.” Float therapy has gained a lot of popularity among elite athletes for healing and restoration. There’s always a reason to find yourself in Summit County because outdoor fun is limitless but Summit County also offers incredible cultural and educational appeal as well. Everything about the alpine mountains points to high-altitude fun in every season. There are a few things that you will want to consider when picking the perfect paint combination for your home. First: your home’s architecture and second: age of your home. The color scheme of the home not only needs to be based off the style of the home, but it also needs to take into consideration its surroundings. A beach house versus a cottage-style home are going to look better in certain colors. Is the area around your home forested? Desert-like? Mountainous? Consider colors naturally found in nature to better blend in. While we are on the subject of surroundings, take a look at your neighbors’ homes. Are you in an HOA? Not that you want your home to look like everyone else’s, but you do want to be mindful of what colors are approved. Consider these qualities before painting to ensure the appropriate color scheme for the style of your home. Borrowed from HGTV, these color schemes are ones we’ve painted on a lot of Breckenridge homes. That’s because they are sleek and modern. You don’t need to completely remodel your home to make it look warm and inviting. Try one of these color schemes instead! For more color schemes and ideas, look here. The above color schemes could not appeal to you and that’s okay! You can simply choose your own colors and do so successfully with a little visualization. This means you will look at surroundings, other nearby homes, and the position of your home. Once you have a selection in mind that will match all the other factors, decide between a neutral color, bold color, or contrasting colors. You can never go wrong with neutral. Not only is it pleasing for the eyes but it’s usually a cheaper option. With this you want to plan around the elements that are hardest to change such as the roofing, trim, and other stone work. A “Greige” (gray + beige) home exterior is a very popular color that is the perfect neutral with just enough color to not be boring. 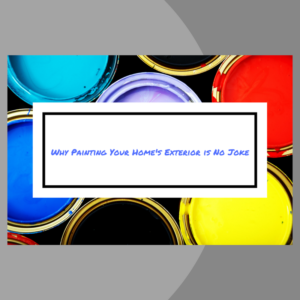 Painting the entire house can be a daunting project and maybe even an unnecessary one! Instead of redoing the whole exterior, opt to add just a pop of color to a smaller surface. Often the first thing a buyer or visitor notices about a home. You may not think of it like this, but it is the entrance to a home and a passage from one world to another. With the right color, it can really stand out. Try red, blue, yellow or even orange for a bolder look! 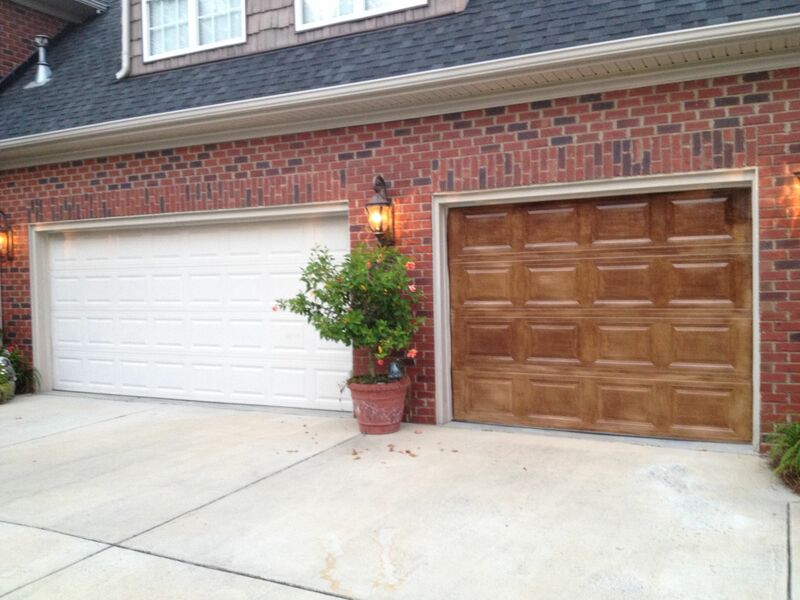 If you want, you can pair your front door with your garage door or update your garage door with a color of its own! Are you not daring enough to try an eye-popping color? Try picking two hues of the same color. It will still be bold enough to give the home dimension and give it an eye-catching look. Another option would be to focus on emphasizing the features of the home such as the trim, woodwork, or other fixtures. When all else fails, try experimenting! 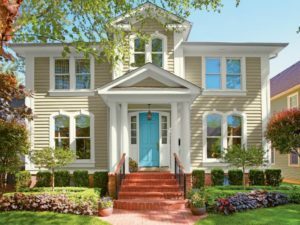 We can talk at length about what colors are most popular, inviting, sought after, but until you put brush to siding, you won’t really know what you’ll like. So paint a few small areas on the house to see for yourself which color(s) look best. Don’t just rely on paint swatches. Allow the paint to dry and then look at the color in a variety of lights before fully committing. Of course, call us at 970 418-5368 cell or 970-547-9778 office if we can do the work for you or even offer some advice! Interior Painting: It’s All in the Prep Work! Are you one of those productive people who is always looking to complete their next project? Yeah, me either! Let’s just say though that you were feeling a little squirrely and wanted to see what it took to paint one of the rooms in your house. Now, I’m not going to lie to you and tell you it’s simple. “Paint Your Home in Five Easy Steps!” is misleading. If you do it right, it’s not simple. You see, I do this for a living and we painters work hard to do a professional job. While I would love to earn your business, that doesn’t mean I won’t share with you some details on how to do it on your own if you’re so inclined. People think painters spend a good majority of their time with a brush, roller or sprayer in their hand… Really, we spend a majority of our time prepping a space to make sure everything is clean, covered, sanded, primed and taped off! Besides technique, that’s the difference between an amateur paint job and a professional paint job – the prep work. This is probably the least fun, but most important step. If you slack off here, your paint won’t adhere as well and you will find debris in the finished product. Not to mention, your paint might be discolored or splotchy in places. Make cleaning easier on yourself and get out the vacuum! Brooms aren’t always efficient at getting out all the dust bunnies from the nooks, crannies, and corners. Make it more labor-intensive by getting on your hands and knees and scrubbing with a wet cloth works well! I’m only joking, but it’s a possibility if you don’t have the proper tools. Easy DIY cleaning solution: In a spray bottle, mix in a few tbsp. of laundry detergent and then fill the rest with water and voilà!! Unless you painted professionally in a past life, I highly recommend taping off edges. Many professionals use a technique called “cutting in” and skip taping altogether. Just know that this takes a steady hand, a great brush, lots of practice and a few mistakes before you can master it. For those of us who don’t want to spend the time learning how to cut in, there’s tape! Who likes taping and putting in all that extra time before the actual work of the painting? Practically no one. But you will find a way to overcome that if you want clean lines and less mess! Your other option is use a drywall taping knife. You use it as a barrier to avoid getting paint on other areas. Shove it up against the edge you would normally tape off. Keep it at a slight angle and move it along with you as you paint. Think of it as a movable tape. A combination of this technique and an angled brush will be your best bet for good looking results. Here is a bonus tip: If you are wanting to use the drywall taping knife, use a wet wash cloth to periodically wipe it off. Or get super fancy and use some blue painter’s tape to mask off edges you know will be exposed to paint and peel off for an easy clean up! Again, do not try to cut corners here. You have the option of moving furniture and belongings into another room, or you can cover them. There’s really no middle ground here. The easiest way to protect them is by covering them! You can do this by purchasing painter’s plastic, a tarp or canvas drop cloth. You can also get resourceful and use something you already have at home. Cut open a garbage bag and spread across furniture and floors. Top sheets! I know that I never use any of my top sheets. They end up in the closet collecting dust. Use an old sheet as your tarp. If you spill paint, allow the top sheet to dry outside and then fold up for another time! Now you may or may not be ready for painting at this point. Consider whether or not you may need to use a primer. If you have an unfinished, “raw” wall, you’re going to need primer. Maybe even a few coats. If your wall was previously painted with a similar paint (latex usually) in a similar or lighter color, you can probably go without. Remember if you are painting straight from the bucket, not to completely submerge your brush in the can. You really only want to dip it in 1/3 of the way. An easier option would be a roller and a paint tray. Bonus: If you are really in the thrifty mode, you can use plastic wrap to line your painting tray and get multiple uses out of it! Make life even easier on yourself – give us a call to help with your painting project! We have over 25 years of experience and can help with any part of the process. We are located in Breckenridge, CO but serve the surrounding areas. We can be reached 24/7 at 970 418-5368 cell or 970-547-9778 office. New Paint or New Siding? Siding is quite an investment so it’s understandable that you would like to try to salvage it if you can. Or if you are trying to find reasons to avoid a DIY project, we can help with that too! If you have wood rot, a new paint coat of paint is like putting a band-aid over a gushing artery. It will only slow the bleeding. You’re likely allowing moisture into your home and removing an important layer of insulation. So your siding is simply a veneer. If you’re seeing moisture inside, please don’t look at your siding. It’s possible it’s compromised and allowing moisture inside. There’s no quick fix for this. You may just be able to fix the affected area, but more than likely, you’ll need to replace all of it. There is no getting around replacing the siding on this one! Bubbling or blistering indicates an excess amount of moisture or heat. Loose or cracked siding could mean poor installation or weather damage. Either way, the siding is likely allowing water and wind damage to the underlayment. So don’t delay! You should call a professional to determine if you need all of your siding replaced or just the general vicinity. If you have noticeable denting from hail, it may be something you can live with. Significant hail damage though and siding may be compromised enough to no longer protect your home from the elements. This one is probably more obvious, but consider replacing high-maintenance siding with a lesser-maintenance option: vinyl. You can select from a wide array of colors and upkeep is simply a regular hose down. 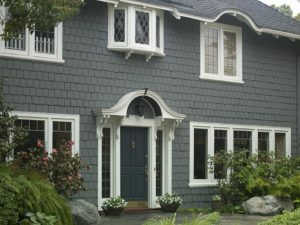 Outdated color could indicate that is been too long since your siding has been maintained or simply poor taste. Just kidding, but consider how long it’s been since you’ve looked at your siding because worn color could mean worn out siding. 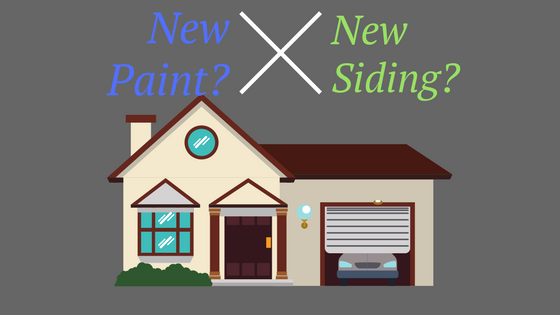 Just with outdated color, consider whether it’s just the paint that is worn out or the siding, too. Siding is built to last a long time so more than likely a new coat of paint will be enough. Siding is responsible for more than just how your house looks. 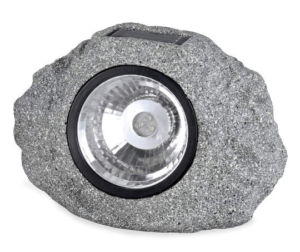 It protects your home from the elements and adds an extra barrier of protection. If you notice your homes electric bills are skyrocketing, siding may aid you in lowering them. Another reason to consider a total replacement would be to give the house a facelift and potentially increase your resale value. Call us if you are near Breckenridge, Frisco, Keystone, Vail or just about anywhere nearby. We can be reached at 970 418-5368 cell or 970-547-9778 office. We can save you a lot of time and headache with siding repaint or replacement. Paint technology has come a long way in the last five years. Paint lasts longer and holds up to elements better than ever before. 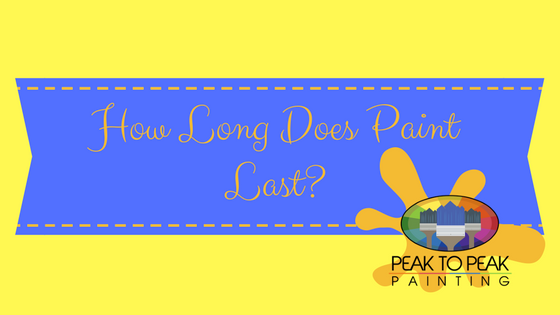 In this article, we will cover how to store paint, how long paint lasts, how to tell if your paint is still good, and how to use it if it is. We will also cover how to dispose or recycle paint if you’re looking to get rid of it. Acrylic paint does not have quite as long a shelf life as oil. If your can was stored in low moisture, at a temperature between 60 and 80 degrees and sealed properly, you can count on 10 years or so for an unopened can of acrylic paint. For oil paint, you have about 15 years. If you’re like most people, you have opened cans. Open acrylic and oil paint stored at these controlled temperatures and covered well will last about two years. First warning, do not shake up the can! More than likely, a layer of thick skin has formed on top and if you mix it up, you will get debris and globs of paint mixed in that will render your paint useless. Okay, maybe not useless, but you will have to pour it through a strainer to get all the lumps out. Be sure to remove the thick skin before mixing up your paint to use it again. Be sure to clean your paint can properly before reapplying the lid. Clean it out of the seal so the lid can close as tightly as possible. If you can, do not wipe your brush on the sides of the can as it makes it hard to get the paint off the rim later. For an additional layer of protection, use plastic wrap to keep air out. You can also store the can upside down so the paint creates an airtight seal against the lid. According to Household Tips Guide, you should not use a hammer to reapply the lid. They recommend a rubber mallet with a gentle touch. A hammer can break the seal or cause deformities in the lid allowing air to seep in. Be sure to keep paint in an area where there won’t be huge temperature fluctuations. Remember 60-80 degrees Fahrenheit is best. If you can’t save the paint for a later date, but the paint is still good, consider taking it to a recycling center. Here in Breckenridge and most of Colorado, you can take your paint into Sherwin Williams and they will recycle it for you. You can also look here to see if there may be another location near you. If there isn’t paint worth saving, you can simply leave the can open to the air to dry out. If you want to accelerate the process, you can add equal parts kitty litter or saw dust to paint. You can also purchase waste paint hardener to dry it up in a matter of hours. Once hardened, you can just throw it in with the rest of your garbage since it’s not considered a hazardous material. Call us if you are near Breckenridge, Frisco, Keystone, Vail or just about anywhere nearby. We can be reached at 970 418-5368 cell or 970-547-9778 cell or 970-547-9778 office. We can save you a lot of time and headache with siding repaint or replacement. 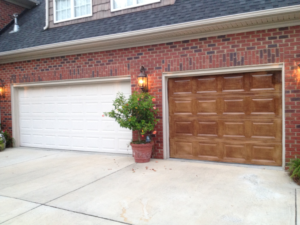 Painting your home’s exterior most inexpensive and transformative remodeling project there is. You may spend a few hundred dollars on paint and materials, but the value you added to your home is well into the thousands if done right. 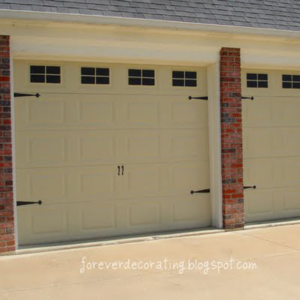 If you have ever painted the outside of your home, you know how daunting it can be! If you get lucky enough to miss weather and paint when it’s not too hot, you still have a challenging task ahead of you. Little rain and low humidity. What I mean by that is, don’t skimp on paint because it seems too expensive. A high quality exterior paint will have color that does not fade or chip as fast. If you skimp on paint now, you will most definitely pay more down the road. With better paint technology, a solid paint job will last a homeowner about 15 years. Paint adheres better to dry and smooth surfaces. Painting professionals will give your home a proper wash using a pressure washer, but you can use a high-pressure hose attachment. You could even work in sections with a regular hose, a little TSP and a scrub brush. Using a scrub brush is less likely to cause damage, but far slower. You must saturate the exterior with water before applying any house cleaning solution. If you use a pressure washer, you can skip TSP, but just cautious that you’re not spraying water under siding or spraying too close. Before you begin making repairs or priming, be sure to cover surrounding plants with a sheet you don’t care about or a drop cloth. Plastic is not good for plants! Allow your home a full day in the sun to dry before taking any further steps. Be very careful not to scrape or sand paint that may have lead present. Remember it is a strong possibility with any home built around 1978 or sooner. Defer to a professional if you are unsure. And wear a mask or respirator even if it’s not! To begin sanding, you can rent a power sander or grinder to remove old layers once you know you are safe! You can even use a heat gun to melt the paint and to help speed up the process. Determine if damaged pieces of siding need wood filler, two-part epoxy or replaced altogether! Wait until your home is primed before applying and caulking. Do not apply paint to damaged wood and expect that it will make it any better. Paint on damaged siding is a waste of your paint and waste of your time. Do it right the first time and repair it or replace it. Use primer or paint and primer to cover your home. Primers will provide a smooth surface for paint to adhere to. You can save yourself time by using a paint sprayer and quickly back-rolling paint on to help it fill every bit of your home’s surface. You’re Now Ready to Paint! Clean your sprayer and fill with paint (unless you used a paint and primer earlier). Make sure you plan which direction you plan on spraying before you begin. You must take care to move quickly to prevent runs. 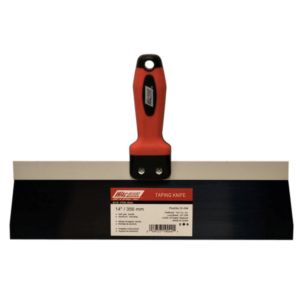 Follow up immediately with a roller to push paint into cracks and crevices. 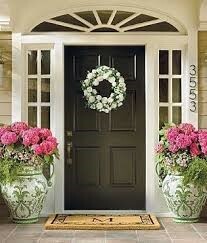 If painting your home’s exterior is not a DIY project you’re interested in, we would love to help! Call us if you are near Breckenridge, Frisco, Keystone, Vail or just about anywhere nearby. We can be reached at 970 418-5368 cell or 970-547-9778 office. Even with over 25+ years in the industry, it does not take not take a keen eye to differentiate between a professional paint job and a DIY one. What usually gives this away? Lack of prep. True professional painters spend more time prepping than they do painting. House painting is not as easy as many DIY shows make it seem. This means cleaning, patching, scraping, sanding, covering, taping, and priming! When you skip prep, it shows! This is true of exterior and interior painting. Luckily, most of these problems are correctable and every single one of them preventable! Keep reading to see what we mean! This one is all too common. If your paint has already dried, the best thing you can do is sand the area, use a tack cloth to remove any sanding dust and reapply paint. If your paint still fairly wet and you can tell you are going to have brush marks, it’s best to go over it with a roller to smooth out the look. This is sadly one of the harder mistakes to correct. It often is a result of painting the subsequent coats of paint too quickly. According to DIY Network, the best thing to do here is use a chemical stripper to remove most of the paint, sand the area, remove sanding dust and repaint. 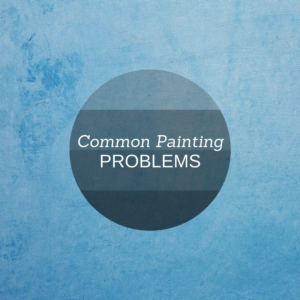 Paint drips are often the result of heavy paint application, but they are easily fixed! The best thing to do is to use a scraper to remove them, sand paper to smooth them and then repaint. Be sure to use a tack cloth or damp cloth to remove sanding dust. First of all, be sure you are using painter’s tape! Please do not use masking tape. 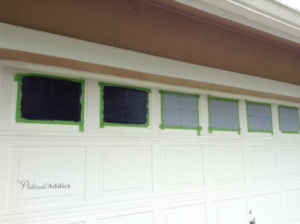 If the damage is already done and the paint has been drying for more than two hours, your best bet is to run a razor blade under the tape as flat to the wall as you can. This way you avoid scraping up the paint. In the future, the best way to remove tape is to wait an hour for the paint to dry but not completely dry and then pull the tape back over itself. Pull briskly, but taking care not to pull so fast that the tape rips. Primer is not a way for paint stores to make more money off you, but they really are necessary! There are some exceptions to this like walls that are previously painted and paints that have primer already in them. Without primer, you might have to use more paint (more expensive) to achieve a consistent appearance, stains from previous years might show through, the paint will not adhere or last as long, etc. Primer covers a multitude of sins and save you time cleaning, etc. so why not! A good paint brush is only a dollar or two more than the cheap paint brushes, but will save you even more! Bristles are less likely to be left behind on your wall, the coverage is better and they often clean up easier saving you from having to buy a new brush as often. If you use a nice primer, you may be able to get away with skipping this step. For those of you who do not mind a little elbow grease, know that washing the wall will allow the primer and paint to adhere better. It will also ensure less bleeding through of stains, dust particles and other debris coming through your paint, etc. And if your wall was painted with a lighter or similar color before, a good wash will likely be enough to allow you to skip primer altogether! If you want to skip the headache of painting and near Breckenridge, Frisco, Keystone, Vail or just about anywhere nearby, give us a call at 970 418-5368 cell or 970-547-9778 office.